Sitting squarely in the middle of our favorite sea monsters is a new entrant in the world of cryptic sea monsters, the Ningen. 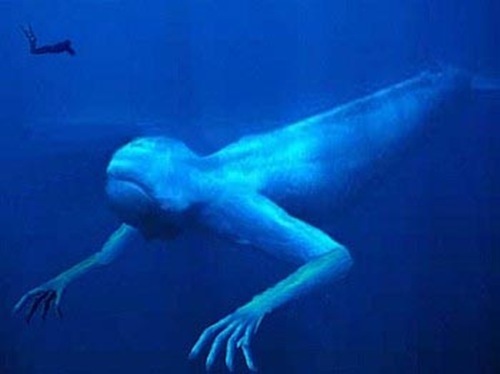 The Ningen is a recent sea monster reported by Japanese fishermen working in the Antarctic. Allegedly, Ningens are up to 30 meters long, have a human like body, and a tail. Reports of what they look like seem to vary quite a bit, but the one consistent bit is that they have a human face and other human features. Despite their impressive size, there are very few actual reports of Ningen, and none that I can find before 2007. Of course, most of the websites are in Japanese, so if any of our Japanese readers have more insight into the Ningen, I’d love to hear it. This creature may be a modern variation of the mermaid myth, or perhaps people are mistaking the undersides of large rays for a human face. More likely is that the Ningen is a case of pareidolia, the perception of recognizable shapes in a random pattern. Of the thousands of large icebergs floating around the Southern Ocean, a few of them are probably vaguely human shaped. The novelty and the sheer number of interpretations of the Ningen has earned this beastie a place among our favorite Sea Monsters. Basic reading comprehension eludes you, eh? Wait, is this guy upset that you claimed that Ningen wasn’t real? Or is upset because he thinks you claimed that Ningen is real? I’m confused. I think he’s upset that he can’t spell Anonymous or use a comma. comment modified as per Rule 5a. In any case, thank you for enlightening me, and the rest of the world community, as to this new beast we need (not) worry about when we prowl the surface of Earth’s last great unknown. You have a great web site, and I truly appreciate your insights into both the real and imagined world around us. And thanks again for all your efforts in enlightening the human community – by helping us to understand our fellow Earth beings. We Humans have a tendency to forget that our ignorance requires interpreters such as yourselves in order for the rest of us to truly appreciate our fellow inhabitants of this planet. I for one applaud your efforts! The ningen. Sirens exists I knew it; wait… ningen with no breast? im not interested now. more unknown creatures out there in the sea!